There are tons of great barbecue and grill accessories that can help take your outdoor cooking to a new level! Not only that, but they can make grilling easier and more convenient. From things to help get your charcoal started to tools to make cooking a delicious meal easier, I'll cover them all here and give you some tips along the way. Barbecue Utensils - No matter how fancy your grill, no matter how many freatures, you've got to have a good set of grilling utensils. From cooking utensils like tongs, spatulas and skewers to basting brushes to things to help your clean-up, these are all basic barbecue accessories that help get the job done. 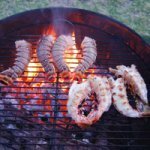 Grill Daddy BBQ Tools - I've just recently had the chance to try out the new, high-end Grill Daddy brand of BBQ tools and I am impressed! The tongs and spatula have become my go-to grill tools. They have some innovative features that make them superior to most other tools on the market. Check them out here! Grill Rotisseries - Rotisseries are one of my favorite barbecue and grill accessories. Rotisserie cooked roasts are about as tender and evenly cooked as you can get. Both hand-turned and motorized rotisseries are made for most types of grills and even come standard on many new gas grills. You can even rig one up yourself if you are creative. Grill Cover - This may seem unimportant, but its critical! Protect your investment! A grill that is protected from the environment will give you years of barbecuing pleasure. One that is left to the elements will rust and corrode and be dead in no time. Most grills do not come with a grill cover so don't forget these crucial grill accessories! Barbecue Apron and Pot-holders - Pot-holders help you protect your hands and arms. The Fire Pit and Grilling Guru has seared the hair off his arms one to many times! A barbecue apron may seem silly, but if you are entertaining guests you want to look your best and protect your duds from all the sloppy marinades and barbecue sauce. Also, you can show your grillin' pride with a well chosen apron. Charcoal Starters - Starting your charcoal can be tricky. And who wants all that stinky lighter fluid! Learn some tricks to get your charcoal glowing hot in not time, without nasty chemicals! I'll cover everything including lighter fluid, chimney charcoal starters and electric charcoal starters. Meat Thermometer - Of all the grill accessories, one of the most important important in my opinion is a meat thermometer. These are so easy to use and it gets rid of all the guessing game. You can tell if your meat is done in the middle even without cutting it open! Digital Meat Thermometer - Like a regular meat thermometer, these help you determine the "doneness" of your large cuts of meat, particularly useful for large roasts that take a long time to cook. But these can be left in and monitored from outside the grill or oven and can even be programmed to alert you when your roast has reached its desired internal temperature! Steak Brands - Steak brands are branding irons that you use to sear your initials or other images into meat! 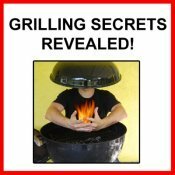 They are a fun grill novelty and make a great gift for your favorite grilling lover. Grill Thermometer - Some grills come with a built in thermometer so that you always know if your heat is right for cooking. If your grill doesn't come with one, then consider getting one to add on. Smoker Box - This is a critical addition to a gas or natural gas grill in my not so humble opinion! Gas grills don't impart any wood smoke flavor or aromas to your food. This is one of the best parts of grilling! So add a smoker box and you can fill it with the aromatic wood chips or chunks of your choice. From hickory to mesquite to mulberry, try them all out and see what you like best. Grill Grates - Grill grates do get gummed up and rusted after a while, especially if you don't clean them regularly and protect them from the weather. You can buy replacement grill grates for most brands of barbecues. Also, if you are a do-it-yourselfer and want to turn your fire pit or campfire into a wood fire grill, you can sit a grate across your fire and cook delicious food in no time. Meat Grinder & Sausage Stuffer - No, this isn't a grill accessory per se, but I really love making my own homemade sausages for cooking on the grill. I recently did research on meat grinders and sausage stuffers and these two products from Chop Rite Two are outstanding. There is even a video demonstrating them both. Grill Warming Rack - Again, some barbecues come with this grill accessory, but you can also buy them to add on to your grill. These give you a 2nd layer of grill grate which is further away from your coals. This lets you keep things warm without burning them. It's also great for warming up hot dog and burger buns and vegetables. Vegetable Basket - Chopped vegetables fall through the grates of your grill. Also, many types of vegetables, even when cut large, are too delicate and fall apart when grilled. That doesn't mean you can't enjoy grilled vegis! A vegetable basket sits on your grill and holds your vegetables while they cook while protecting them. Side Burners - Some gas grills come with these but you can also buy them as add-on grill accessories. This allows you to cook all your foods outside. Soups, sauces, or stir fry, you can cook it all in a skillet, pot or wok right by the side of your grill! Condiment and Tool Holders - This probably doesn't make your food any better, but sure makes your life a little easier. Tool holders keep all your grilling utensils right at hand and condiment holders are perfect for ketchup, mustard and even marinades and sauces. Everything is on hand when you need it! Work Tables - If you grill doesn't come with side work tables I strongly recommend adding some. 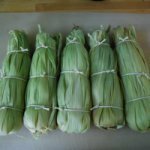 It makes staging and preping food much easier. If you have your grill right next to a counter or picnic table you may not need these, but the sure come in handy otherwise. Weber Grill Accessory and Parts - One of the most famous names in outdoor cooking, Weber has many great accessories available for their grills. They also supply replacement parts for their grills. 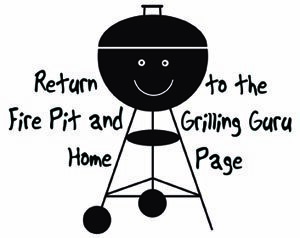 Go see my information on how to find a Weber grill part or find a Weber accessory. CharBroil Parts and Grill Accessory - Char-Broil makes a range of excellent grills and smokers. Find out about their available grill accessories and where to find replacement parts. Lynx Accessories - Lynx is like the high-end sports car of gas grills. They are fully customizable and offer a slew of barbecue accessories to make your Lynx grill even better. There you have it. While most of them are not absolutely necessary, many of these grill accessories will bring your grilling to a higher level and make it a lot easier for you! More items to put on your birthday wish list! Return to the top of the Grill Accessories page.